Kermit the Frog stops by CNN before heading to the White House Christmas tree lighting and talks politics with CNN’s Wolf Blitzer. The transcript from the interview is after the jump. Full transcript is posted on CNN.com. KERMIT THE FROG: Oh, hi there. HOLMES: The green man himself, Kermit the Frog. Young fellow, how are you doing? KERMIT THE FROG: Yes, sir. I’m doing very well. How are you? If I look over there, I can almost see you. HOLMES: Do you see me there? Yes. You’ve talked to — I’m sure you’ve met presidents before. You just get used to this? Is this just a routine night for you tonight? KERMIT THE FROG: It’s always fun to meet presidents. I have in fact met several. But it’s fun to do. But I’m really excited to be here. I’ve never been a part of the tree lighting before. That’s particularly fun. HOLMES: They have a lot of stars that will be there tonight. You among them, none bigger than you necessarily. But still, who are some people you’re looking forward to seeing tonight? KERMIT THE FROG: Well, One Republic is this wonderful band of young guys. I just met them this morning, heard them rehearsing this morning. That will be fun. But I do actually get to read “Twas the Night before Christmas” with the first lady. HOLMES: Have you met the first family before? KERMIT THE FROG: No, I can’t say I have. But you would be surprised how easy it is for a frog to get security clearance. HOLMES: Yes, I am surprised how easy that is. HOLMES: And you have been around for quite some — how old are you, Kermit? I don’t even know. KERMIT THE FROG: Thank you very much. I try to work out and stay in shape. I am actually 55 years old. I know that’s hard to believe. and I got my start right here where I am today in Washington, D.C.
KERMIT THE FROG: That’s true. HOLMES: You’re not retired. You’re not anywhere close to retiring. KERMIT THE FROG: No, no. HOLMES: In fact, you’ve got a busy schedule now. You’ve got — what is this? This latest project of yours? That’s a big joke back in the swamp. HOLMES: That’s pretty good. What are you looking around at in the studio there? What is around you right now in our studio? 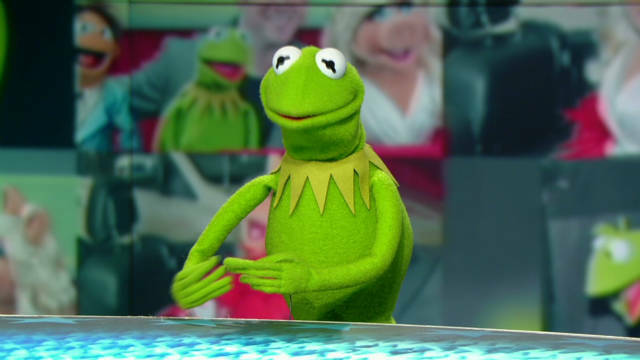 KERMIT THE FROG: I’m absolutely alone, except I think I see Wolf Blitzer over there. KERMIT THE FROG: He’s hanging out. He’s hanging out. We’re old friends. Sure. HOLMES: Can you tell him to come on in? I have him next. Tell him to come on in. WOLF BLITZER, HOST, THE SITUATION ROOM: I don’t know if you can see me. HOLMES: Oh, there you are. We’ve got you. BLITZER: I am so excited, T.J., that Kermit — he is a journalist, like all of us are journalists. He is a reporter. Kermit, you’ve done some major reporting over the years, right? KERMIT THE FROG: Yes, I have. One of the most — journalistic integrity. That’s the name of the game. KERMIT THE FROG: Back when I worked with Rapunzel on “Sesame Street,” yes, there was all sorts of stuff behind the scenes with her you don’t want to know. BLITZER: You are really good. And I know it will be very exciting. This is a political season and a lot of people will be voting right now. You’re going to be reporting on all of this, right? KERMIT THE FROG: I’m going to try. I’m afraid, as a frog, we cannot vote. KERMIT THE FROG: No. I am an Amphibian-American. I am proud of it. I am taking a certain issue to discuss with the president, if I can. That’s interspecies dating. KERMIT THE FROG: Which evidently Miss Piggy is for. I’m not so sure about. But, yes. HOLMES: So you’ll raise that issue when you see the president? KERMIT THE FROG: Yes, sir, I will. I wanted to tell all of the animals out there in the world and any people who might date pigs that it will get sorted out, folks. BLITZER: It’s very exciting for me. Do you know what my first name is? KERMIT THE FROG: I do. I do. KERMIT THE FROG: The first time I ever heard it, I thought you were an actual wolf. BLITZER: That’s what I mean. It is exciting for this Wolf to meet this frog. KERMIT THE FROG: You should have your own news net boring. It should be Wolf News. KERMIT THE FROG: I think so. BLITZER: What about frog news? KERMIT THE FROG: Maybe we can join up. KERMIT THE FROG: I’ll let you have top billing. Wolf and frog. KERMIT THE FROG: Works for me. WOLF: What do you think, T.J.? HOLMES: I think, Wolf, I’ve seen you interview a lot of people over the years, and I’m hearing better answers coming from Kermit right now than a lot of them. KERMIT THE FROG: Frogs make the strangest people. It’s strange. BLITZER: You are good. I’ve seen you grow over the years, too. You’ve matured. KERMIT THE FROG: I have. I have. BLITZER: Maybe 20 or 30 years ago, you were not the frog that you are today. KERMIT THE FROG: I was not. I was barely out of being a tadpole. I had just dropped my tail and grown my legs. KERMIT THE FROG: And now, here I am on dry land with you. BLITZER: What experience — what advice do you have for younger frogs out there who are just beginning this whole experience? KERMIT THE FROG: Well, you know, it’s tough time in the world today as a frog. If you’re small and green, sometimes you have to get comfortable with being green. And then you go on, like I did, to try to find the rainbow connection, you know? I’m not saying you find it, but you have to look. You have to keep looking. BLITZER: That’s good advice for a lot of young aspiring frogs out there. Are you going to be the only frog at the Christmas tree lighting ceremony later tonight? KERMIT THE FROG: Well, I’m the only talking frog there. I think there will be others hiding in the bushes. In fact, there is a whole family of frogs that actually lives in the tree. KERMIT THE FROG: Yes. There are tree frogs and they’re living there. They’re going to look after the thing when the national rangers aren’t quite there. BLITZER: It will be very exciting. I hope when you go through the security and they — the magnetometers. BLITZER: You have no metal on you or anything? KERMIT THE FROG: I have no metal on me at all. I’m not even wearing clothing. It is wonderful at airport security to go through naked. BLITZER: You don’t to have to take off your shoes. KERMIT THE FROG: No. I don’t even wear shoes. BLITZER: Well, T.J., do you have a question for Kermit? HOLMES: My question was for you. I was going to ask him a political question but I know he doesn’t want to get into that, but political headlines. (CROSSTALK) HOLMES: Is that all right? You want to get into politics? KERMIT THE FROG: If I can’t answer, I simply won’t. Just like all those candidates. BLITZER: We’re going to have Kermit, one of these days, I’m predicting this, T.J., here in the “Situation Room,” in our strategy session. And we’re going to have him go against somebody else. I don’t know. Who do you think would be a good downer point for you in the strategy session? KERMIT THE FROG: I have to tell you, Newt is from the swamp. There are other Newts in the swamp, too.